A powerful iron with 1,500 watts, this Hamilton Beach model heats up quickly and keeps you informed of all its settings with a bright, colorful display. The soleplate is sturdy and glides smoothly over clothes; we learned to carefully avoid zippers, however, because the heat can damage them. There are no water leaks or spits of steam on the clothes. While the water tank is somewhat tricky to fill, it holds a lot of water. 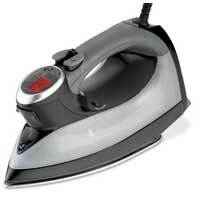 Overall, this iron has a nice heft and balanced feel to it, and it’s affordable at $27.53.